Derive an expression for the frequency of free torsional vibrations for a shaft fixed at one end and carrying a load on the free end. Discuss the effect of inertia of a shaft on the free torsional vibrations. How the natural frequency of torsional vibrations for a two rotor system is obtained ? Describe the method of finding the natural frequency of torsional vibrations for a three rotor system? What is meant by torsional equivalent length of a shaft as referred to a stepped shaft? Derive the expression for the equivalent length of a shaft which have several steps. 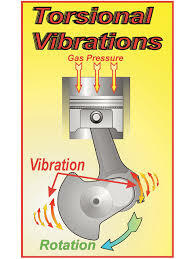 Establish the expression to determine the frequency of torsional vibrations of a geared system. A shaft 200 mm diameter and 1 mt long is fixed at one end and the other end carries a flywheel of mass 1.5 tonne. The radius of gyration of the flywheel is 0.5 m. Find the frequency of torsional vibrations, if the modulus of rigidity for the shaft material is 75 GN/m2 . Three rotors A, B and C having moment of inertia of 2000 , 6000 ; and 4000 kg-m2 respectively are carried on a uniform shaft of 0.4 m diameter. The length of the shaft between the rotors A and B is 6 m and between B and C is 32 m. Find the natural frequency of the torsional vibrations. The modulus of rigidity for the shaft material is 80 GN/m2. Two parallel shafts A and B of diameters 50 mm and 75 mm respectively are connected by a pair of gear wheels, the speed of A being 4 times that of B. The flywheel of mass moment of inertia 3 kg-m2 is mounted on shaft A at a distance of 0.9 m from the gears. The shaft B also carries a flywheel of mass moment of inertia 16 kg-m2 at a distance of 0.6 m from the gears. Neglecting the effect of the shaft and gear masses, calculate the fundamental frequency of free torsional oscillations and the position of node. Assume modulus of rigidity as 80 GN/m2.